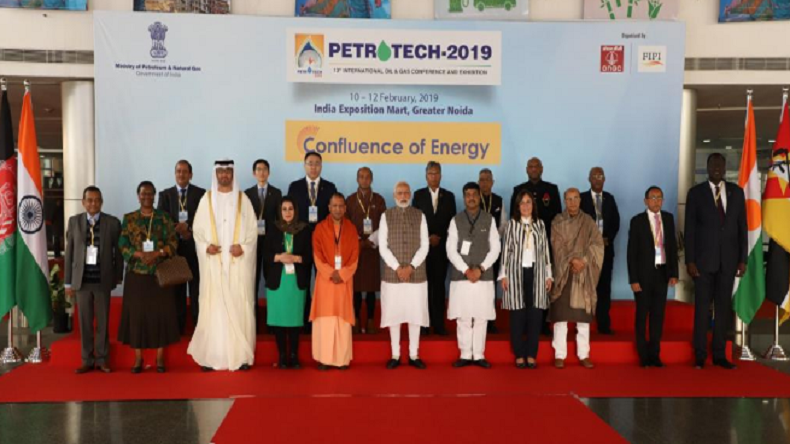 Prime Minister Narender Modi on Monday inaugurated the 3-day India’s flagship hydrocarbon conference and exhibition—PetroTech 2019 at the India Expo Mart. The Uttar Pradesh Chief Minister Yogi Adityanath, Union Minister Dharmendra Pradhan, Mahesh Sharma were also present at the event. 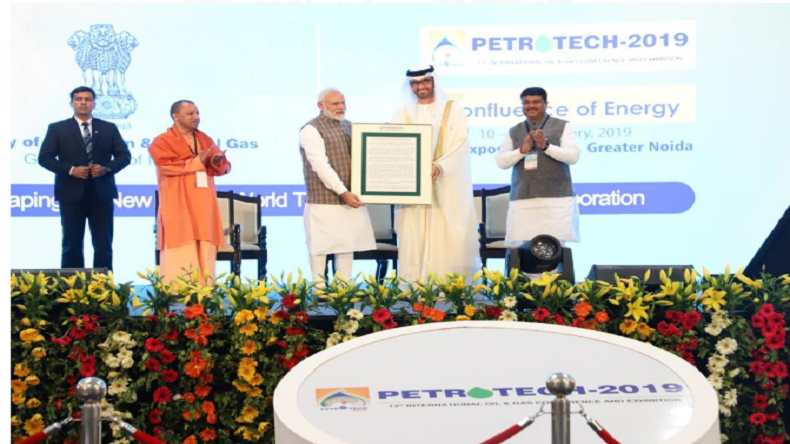 Prime Minister Narender Modi, UP CM Yogi Adityanath, Union Minister Dharmendra Pradhan, Mahesh Sharma on Monday inaugurated the 3-day India’s flagship hydrocarbon conference and exhibition—PetroTech 2019 at the India Expo Mart. At the event, ministers from abroad and eminent delegates were present also present. Prime Minister Narendra Modi presented the Lifetime Achievement International Award to Dr Sultan Al Ahmed Jaber, Minister of State of UAE and CEO, ADNOC. Speaking at the event, Petroleum and Natural Gas Minister Dharmendra Pradhan said that the energy occupies a very important place in Prime Minister’s vision for India. India has seen unprecedented reforms in the last five years in the energy sector. He added that these reforms have accelerated the government’s efforts to deliver energy justice to the poorest of the poor. He said that by adopting the four pillars visualized by PM Modi— energy access, energy efficiency, energy sustainability and energy security as our guiding principles. The Union Minister further added that the world is witnessing a dramatic change in the sources of energy supply and consumption. There has been a big change in energy consumption from OECD countries to developing Asia. Electric vehicles would also change the consumption patterns. The US has become the world’s largest oil and gas producer after the shale revolution and challenging traditional oil dynamics. The affordable solar PV have been taking the increase in share in the mixed supply, helping to reduce carbon footprints. The Minister said that today, India’s voice as a large, reliable energy consuming nation is heard with respect. We have been able to convince the oil suppliers about India’s as well as all-consuming nations justified stand for responsible and reasonable pricing. We have been able to simplify and reform our oil and gas sector policies and guidelines to attract new investors and inject new technologies. Schemes like Ujjwala and expansion of CGD have proved to be game-changer in drastically ramping up access to clean cooking fuel to millions of common people. Such initiatives are not only leading to energy justice, as envisaged by Hon’ble PM, but also business opportunities and addressing climate change as well as local pollution concerns.